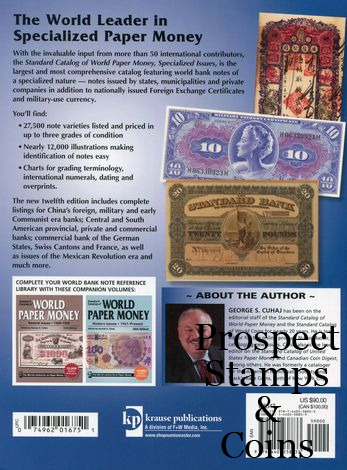 The demand for collectible world paper money continues to grow, and the ninth edition of this definitive resource for specialized paper notes is completely updated and expanded to reflect the most current values and new varieties. 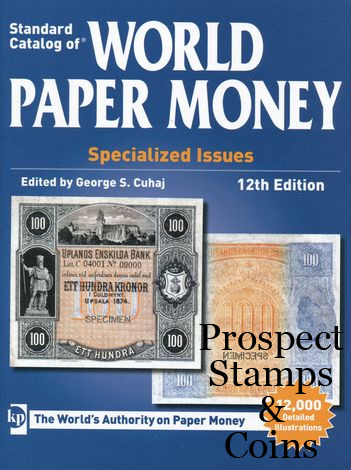 Comprehensive coverage includes Central and South American provincial, private and commercial bank issues; foreign, military, provincial and early Communist bank issues of China, European Colonial and Worldwide Revolutionary issues, and numerous other notes. More than 12,000 photos aid in the identification of more than 17,500 notes. Values for each note are listed in up to three grades of preservation for a total of more than 52,000 prices. Additional information includes international grading terminology, foreign exchange rates, dating charts and standards, and international numeral systems. Numerous historical facts and illustrations are provided.